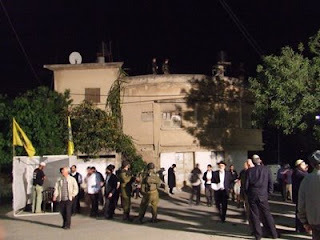 Almost every year, on 26 Nissan, the Army puts the town of Kifl Hareth under curfew to allow Jews to daven at the Kevarim (graves) of Yehoshua (Joshua) ben Nun, Calev (Caleb) ben Yefuneh and Nun himself. 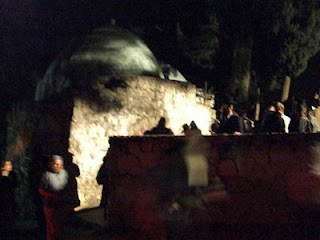 Until this year, Jews were admitted to the town from midnight until 4 a.m. or so. This year, the Army extended it from 10 p.m. until 4:30 a.m. Although they didn't actually allow people to start going into the town to walk to the Kevarim until 10:30 or so (and from the entrance it was about 20 minutes to walk to the Kevarim). I live in Ariel, which you can see by this map is just across the road from Kifl Hareth. 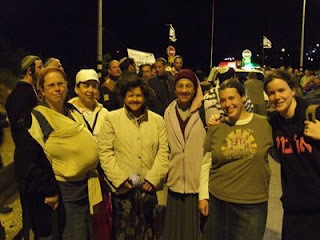 Many people from Ariel, including a group of us 'Anglos' went to daven. 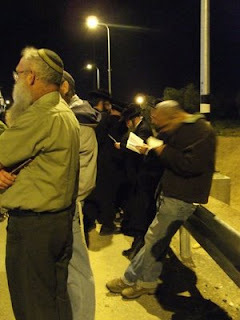 Buses were arranged from all over (I met with a group from Elkana and I know there was at least one carload of people from Ramat Beit Shemesh) and throughout the night and early morning, thousands of Jews took this once a year opportunity to visit the Kevarim. Throughout the town, we had groups of soldiers on guard, to make sure no one started anything (between the locals and us and us with the locals). Some of the Anglo women. I'm on the far left and I'm 'wearing' Elchanan. 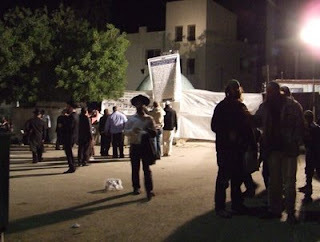 Waiting in the staging area, people from all 'flavors' of Judaism were here to daven. A class of boys who have been learning Sefer Yehoshua came to finish the Sefer and have a Siyum. 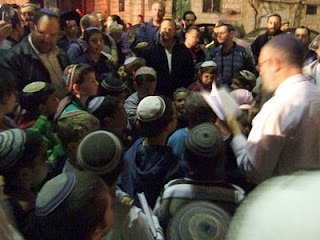 The Yeshiva is the third grade from the Talmud Torah in Eli. Fantastic post/pics. Make sure to send the link to jpix.